Kutna Hora is an atmospheric medieval town with a rich architectural and historical background. See photo. This cathedral sized house of worship was built for the town’s many miners and is named for their patron, St. Barbara. 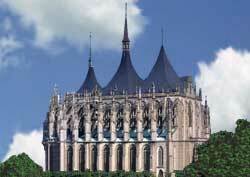 It began to rise in Kutna Hora in late 1300s and took two centuries to complete. Outside, this Late Gothic structure has grand flying buttresses and soaring spires. Inside, visitors admire the magnificent vaulted ceilings and precious fresco paintings. A former mint and royal seat. The Italian Court guided tour includes a coin-making demonstration plus a walk through the king's residence. The royal chapel is a petite artistic jewel. The interior of the chapel is eerily decorated with the bones of people who passed away centuries ago in the plague and war. Their human remains were assembled into various shapes, including chandeliers, chalices and crosses. This destination also goes by the names Kostnice (Czech) and the Sedlec Ossoury - and is in the Kutna Hora outskirts.